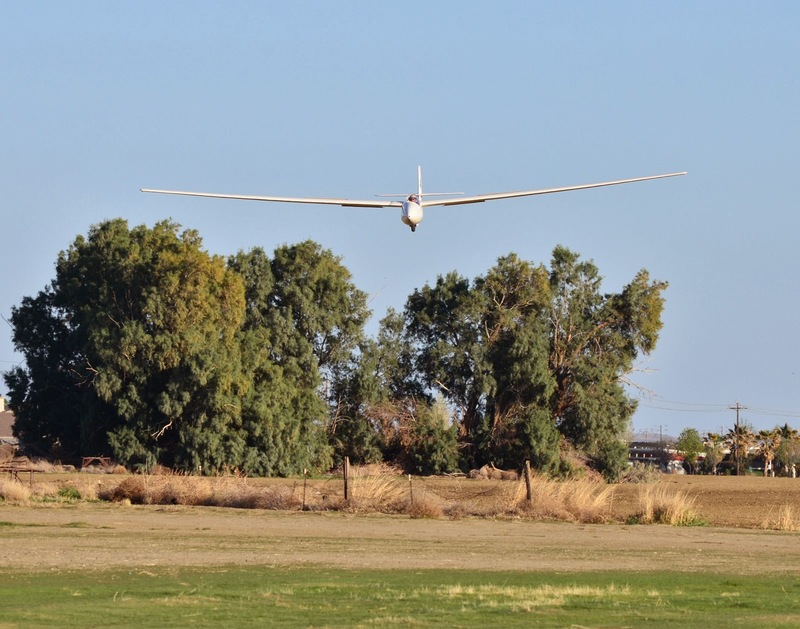 Central California Soaring Association: March 22, 2014, Spring Soaring at Avenal. Clouds, Eagles, Ravens, friends. 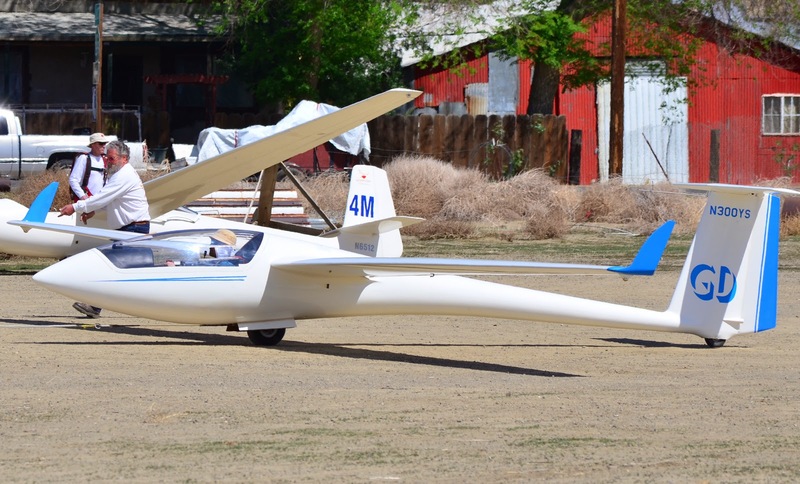 March 22, 2014, Spring Soaring at Avenal. Clouds, Eagles, Ravens, friends. 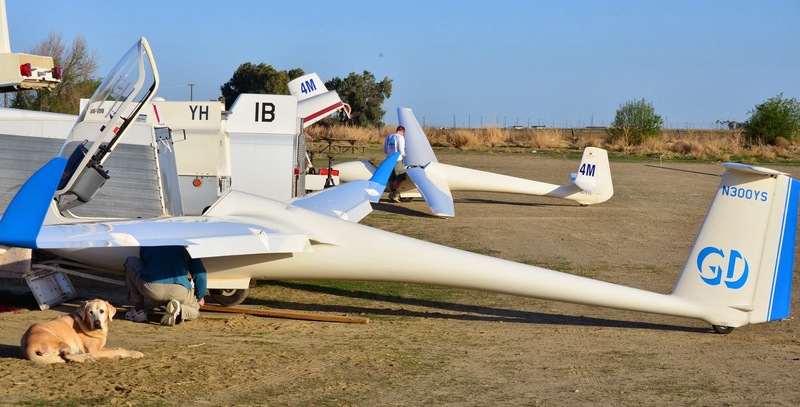 Wind: 0-7 knots, peak gust of 11 knots recorded at nearby NWS Avenal recorder. Altitudes: 8,000' by Julie, Morgan and Pancho over the hills; 5,100' in the 2:33 in nearby thermals. Time Aloft: Morgan, 4:23, (hours:minutes). Carl and Harold held the 2-33 up for 2.2 hours. Max Lift: Thermals were not strong, but had a good diameter and persistence. Temperature: 64º @ 10:00 AM, peak of 76º just before 5:00 PM. Comment: A very pleasant day. 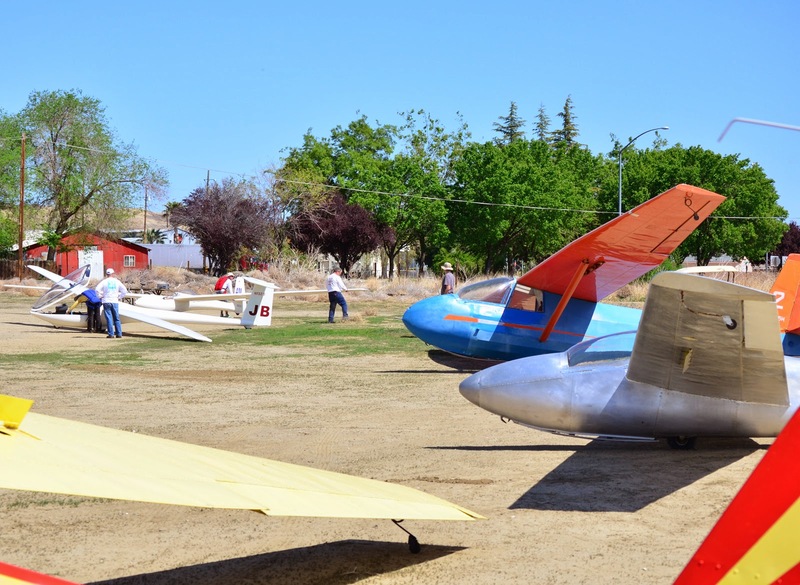 A great day at Avenal Gliderport today. Temperature was a very pleasant 64º at the start of the day, with a peak of only 76º just before 5:00 PM. After everything was put away and the sun was setting, Morgan, Julie, Pancho and Jim were sitting on the patio when Julie remarked how nice the weather was at that moment, and in fact had been great the whole day. Yet it was warm enough that there was thermal activity. 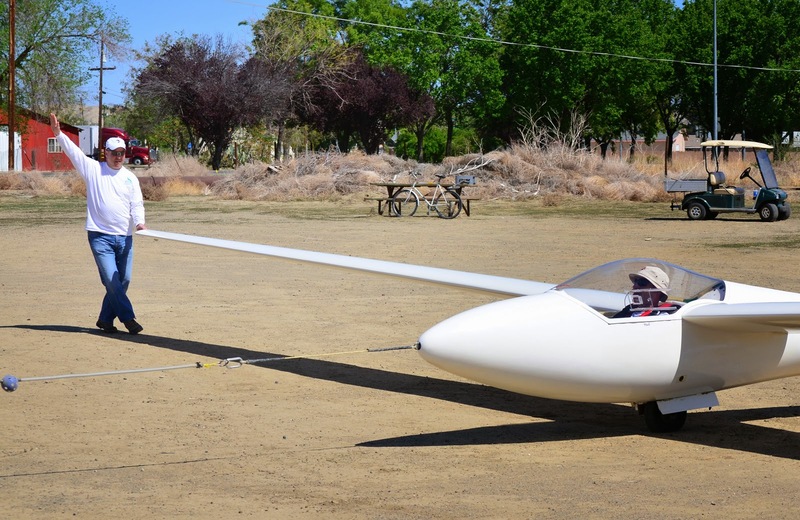 Alex and Jim launched a few minutes after 3:00 in Orange Crush, and after a tow to 3000' were able to find enough thermals to soar until a few minutes before 5:00. 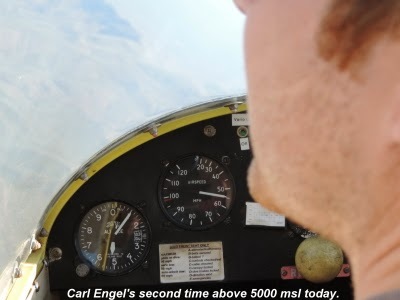 Even better, Carl and Harold launched at 2:25 PM and were able to stay up for 2.2 hours, reaching 5,100' at 3:03 PM. Not bad for the second full day of spring! Morgan and Julie gave Pancho an introduction to the hills today. 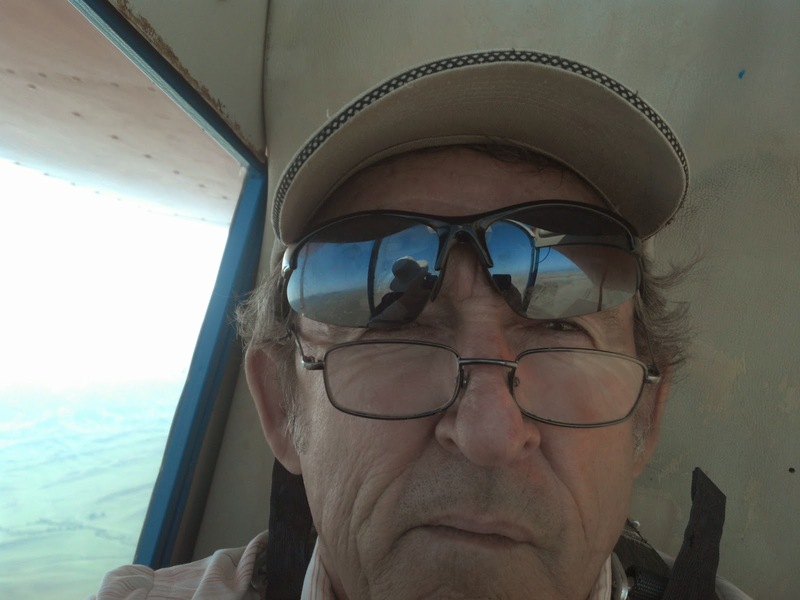 This was Pancho's second flight in the new-to-him Libelle, and it allowed him to venture farther than before. Alex: "Craig is doing quite well. 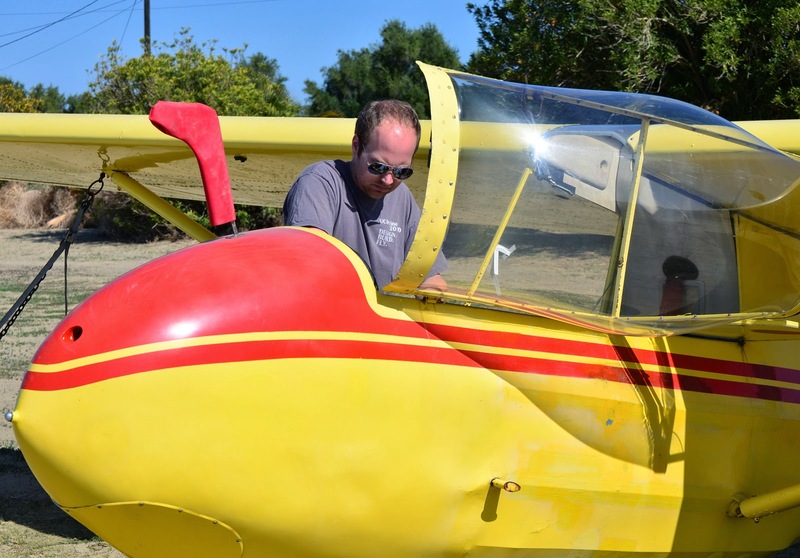 After 7 flights he is doing the take off, tow and landings by himself, and will be starting to box the wake and begin focusing on emergency procedures next." 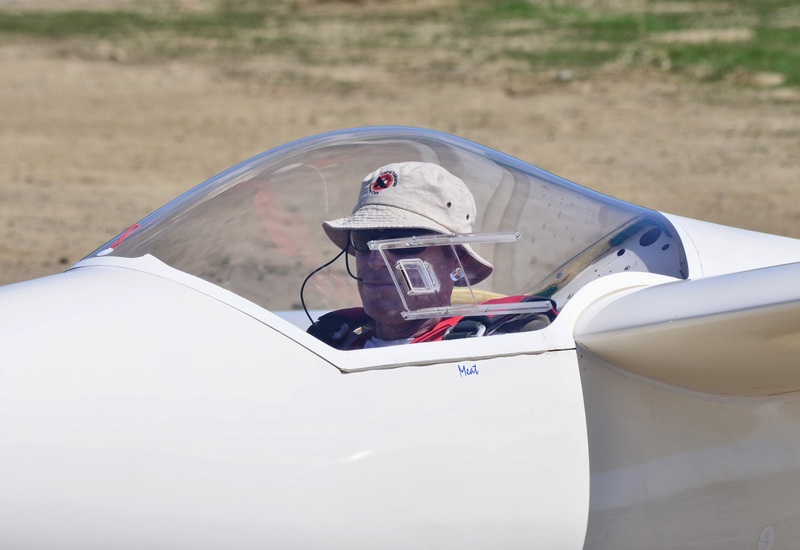 Carl Engel is concentrating on getting ready for the checkride, so has left the fun of the 1:26 and is back flying the 2-33A. Here he is preflighting "Big-Bird." Frank Owen is pulling 05U out of its hangar for a day of towing. Andy is getting his Russia ready to fly. Harold conducted a ground school for Carl, who had invited Jim to listen in...no photos were taken for a while. 1:37 PM (remember that). Morgan launches with Allen White running his wing. Small dust-devils are present, and the launch area is getting busy. Pancho is eagerly looking forward to his second flight in his new-to-him Libelle. 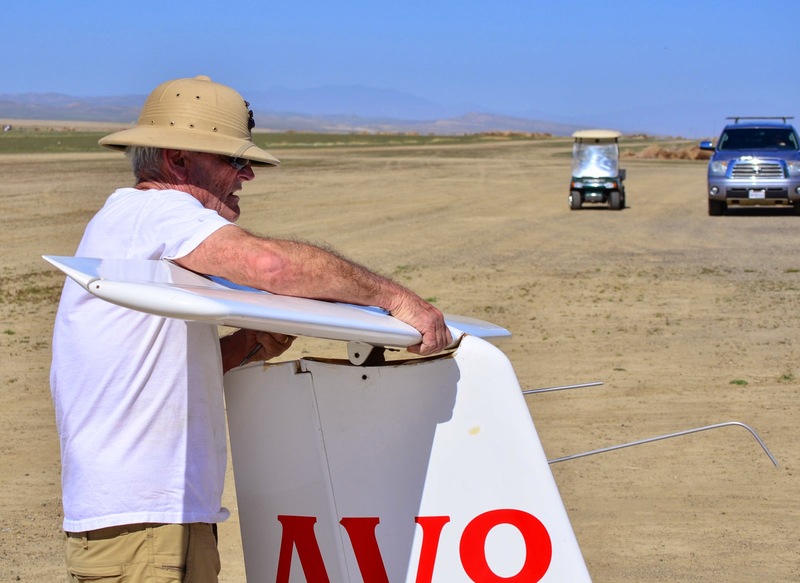 Allen White, with 14,000 tows under his belt, is running the wing for Julie. Looks like Frank is going to pull Julie straight to the cloud. Pancho and I were intending to fly together today, and after a warm up flight we both launched for a second time around 2:45. 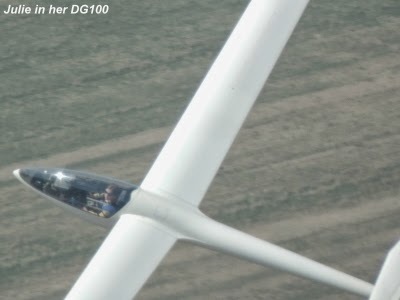 I got off at 2000 AGL in a nice thermal to about 3800 and headed for the hills where I didn't find a lot. 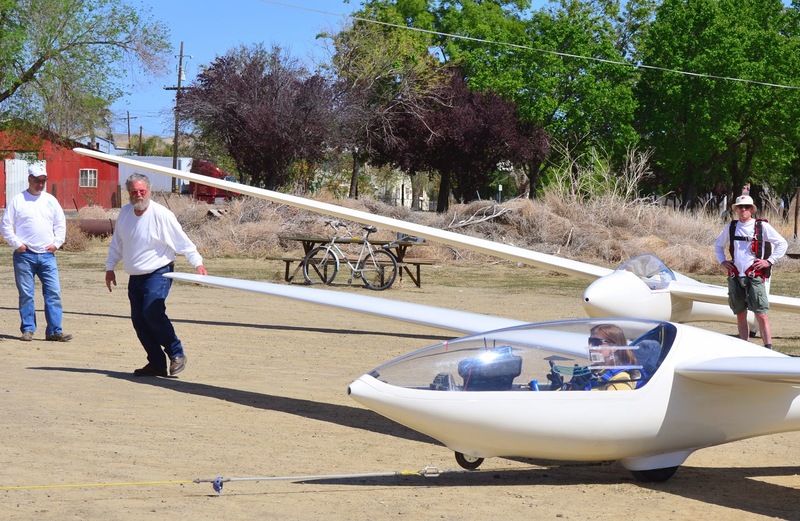 I returned to the valley where I spotted Big Bird, piloted by Carl Engel, thermalling and decided I would join him and shoot some video. After getting back up to 4K, I tried in the mountains, again without luck. So back to the valley for a third shot, this time sharing lift with Big Bird and Pancho in 4M. The thermal was stronger on this last attempt and got both Pancho and I up to about 5K. I rolled out and headed to Black Mtn. with 4M in tow. We circled on the first ridge to regain some altitude, then Pancho lead the way onto the shoulder of Black. 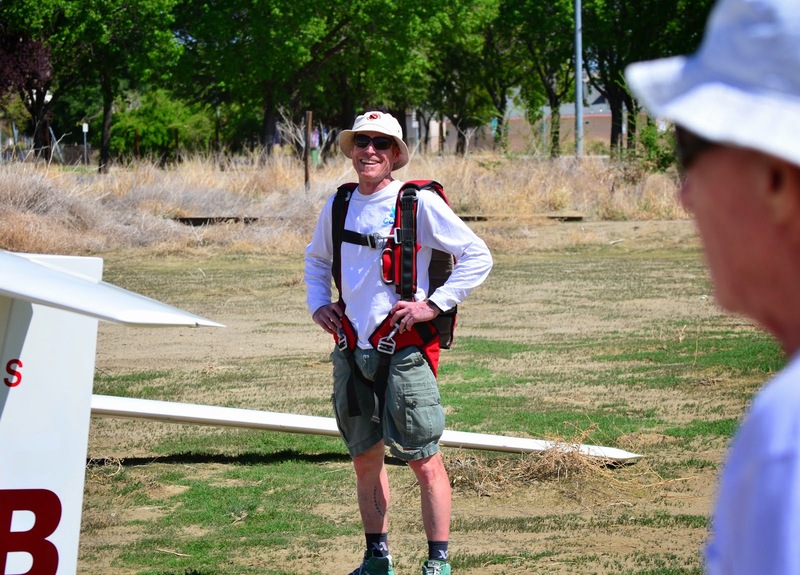 He hooked a nice thermal to give me some direction, then Morgan joined us as he returned from the north. We were also joined by a golden eagle who was not happy with our violation of his airspace and proceeded to dive bomb both Pancho and me. All three of us were able to climb to about 8K and took off North with Morgan leading the way along the convergence line. 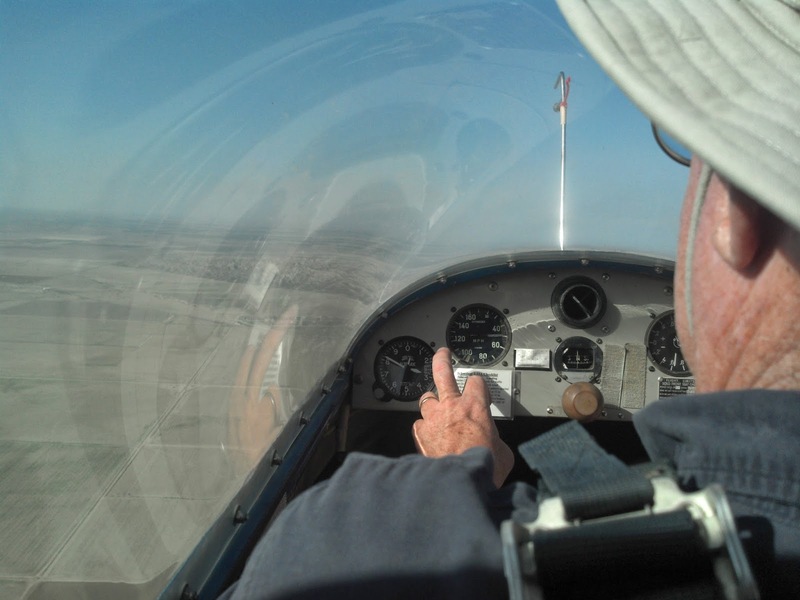 Once abeam Coalinga, we turned and headed south; Morgan and I proceeded to tag Orchard Peak, but Pancho couldn't resist playing under the clouds and had climbed back out to 7500 or so by the time Morgan and I returned to the area. 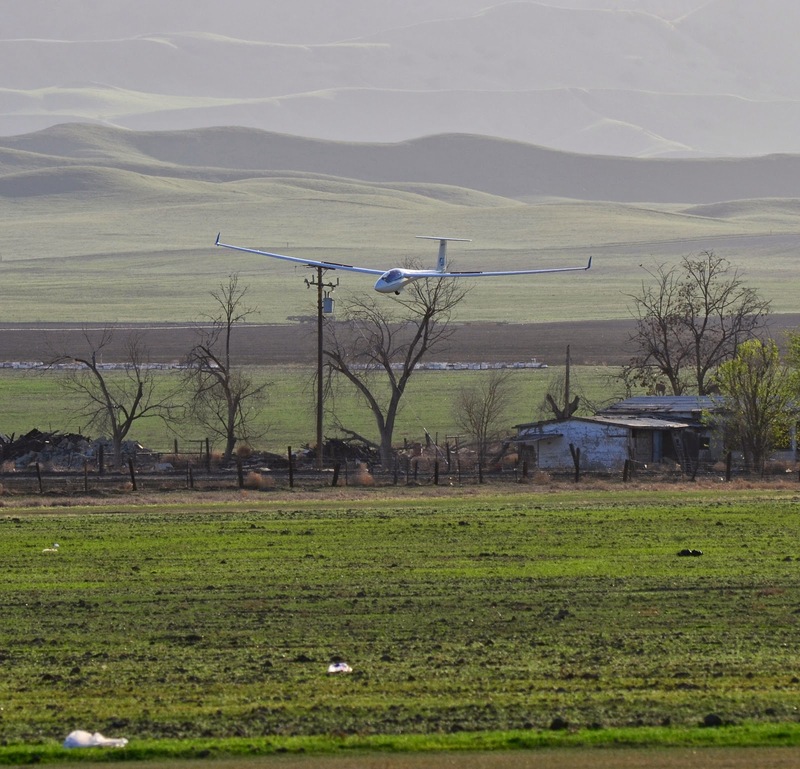 I was ready to head home, but wanted to add a little distance to my OLC triangle, so I flew out to tag the water tank at the top of the Kettleman Hills before retuning to land and rescue Katie from the car. 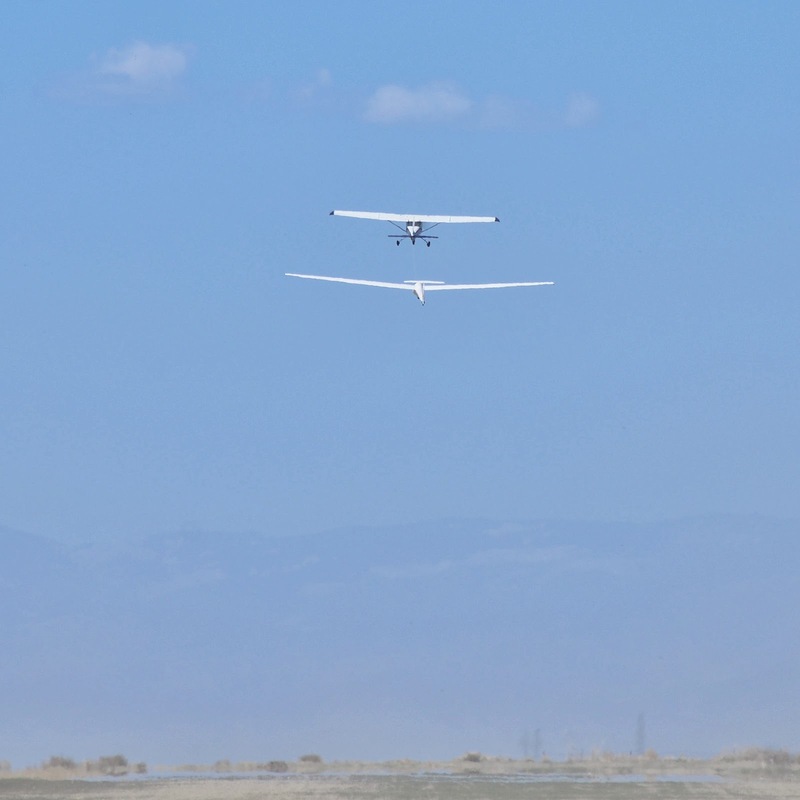 It was really awesome to be able to fly with other gliders and help one another find the best lines of lift. Awesome start to the season. Julie shot some video, which you can see here, Better yet, go to Julie's YouTube page and see a higher resolution version of the video. Carl ready for takeoff with Harold in the back seat with camera ready. 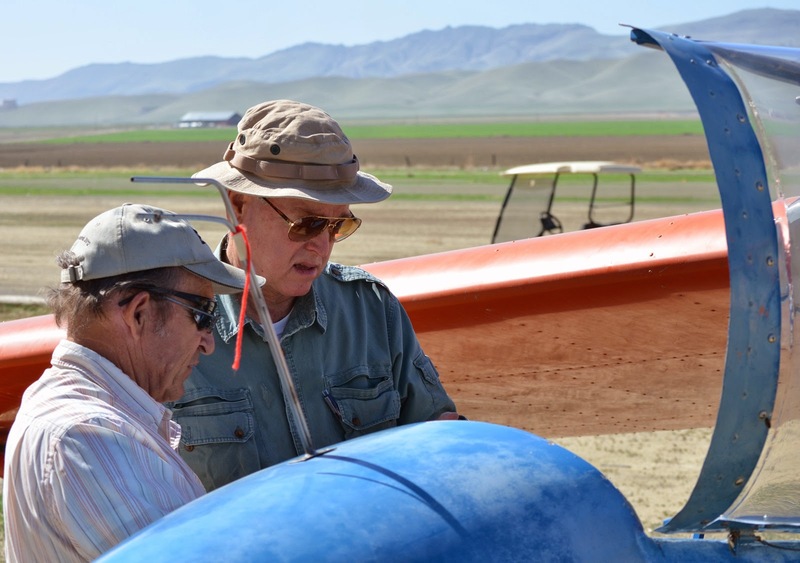 "Harold and I were up in Big Bird for 2.2 hours, reaching a max altitude of 5,100 ft. Harold should have some good pictures of Julie and Pancho thermalling with us. We also took a trip out to the first ridge line (my first) and found a bit of lift there." Look closely and you can see Jim's head on swivel, too, as he is looking for that "Big Bird." We flew for 1.8 hours with no variometer. 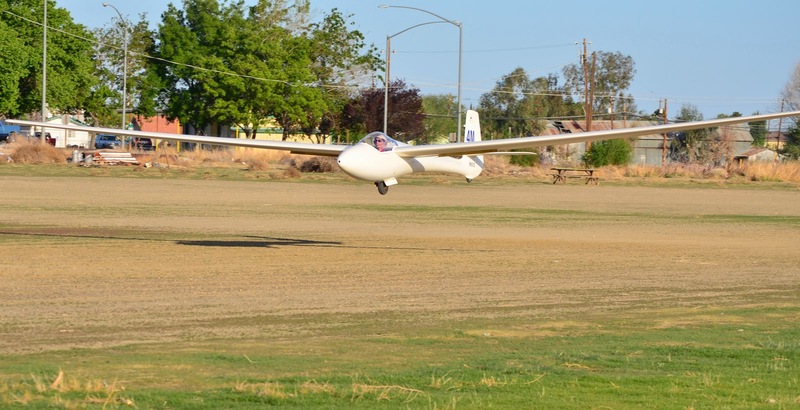 (A vario is not legally required in a 2-33, but needs to be placarded as "inoperative" if it is installed the glider but not working.) "It made me concentrate more on the "seat of the pants feel" for what is going on. Sometimes it was hard to tell if a little bump was indeed lift or just a decrease in sink. Looking at the ground would give a long term progress report, and frequent gentle taps on the altimeter would give us quick feedback if we were in the right spot or it was time to move somewhere else. Of course, having Alex on board, with his knowledge of lift spots, I ventured further than I would have by myself. At one point we saw Big Bird in a thermal that was better than our thermal, and decided to join them. But we did not get in sync to mine or Alex's satisfaction. I could not figure out what "Big Bird" was doing, or even be assured "Big Bird" even saw "Orange Crush." (Looking at the pictures now, it is clear he was maneuvering for a picture.) 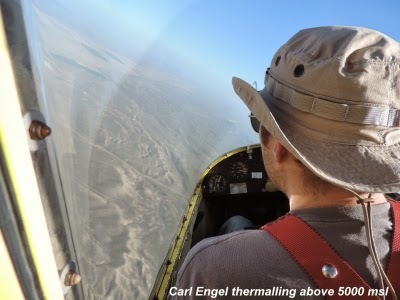 I had no idea that it was still Carl and Harold in "Big Bird," so long after they had launched, so when they got into a position that we could not see them, (two pictures above), we decided it was time to go find our own thermal. As we were heading back to the gliderport--for the third time--I saw a couple of crows, which had found some lift but with an occasional flap of their wings. I joined with them for a turn and a half, but as I rose to about 30 feet beneath them, they must have decided they were lower on the food chain than an "Orange Crush," and they left as quick as they could, unlike Julie and Pancho's Golden Eagle! 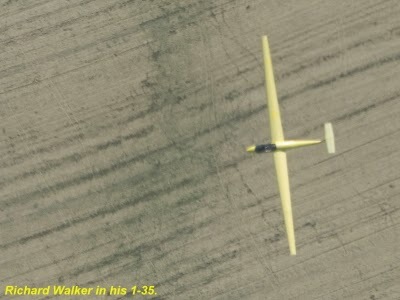 Alex asked me to, "throw in something about you focusing on the accuracy landings in prep for your commercial checkride." The accuracy of landings and rolling out to the desired spot were slow coming for me. 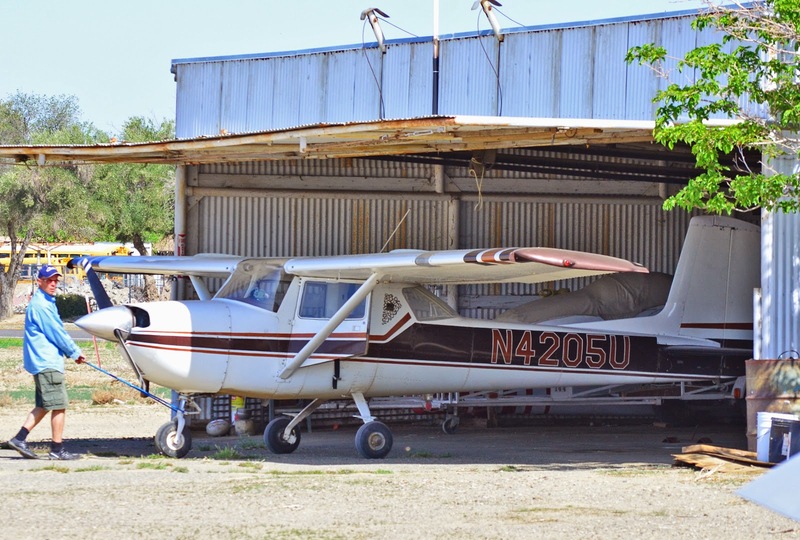 Almost all of my flying since 1985 has been in the Cessna 210. What is a normal sight picture on short final in the 2-33 is well past the time I should have aborted the landing in the 210. The sight picture at the desired touchdown point in the SGS-2:33 would have been too late to go around and without enough room to get the 210 stopped. 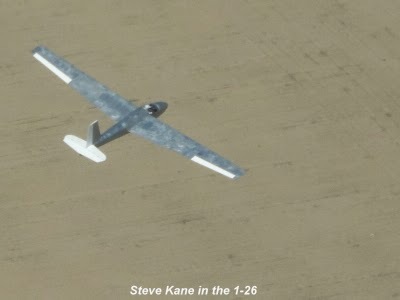 If I had ever seen that picture through the windshield of the 210 of so little runway left, I can only imagine rolling the plane into a ball of scrap aluminum after it speeds past the end of the runway into a ditch, or buries the nosewheel in soft ground and does a forward flip, or slams into an obstruction. I had to really push myself to get over that. Meeting the PTS landing goal is starting to happen! 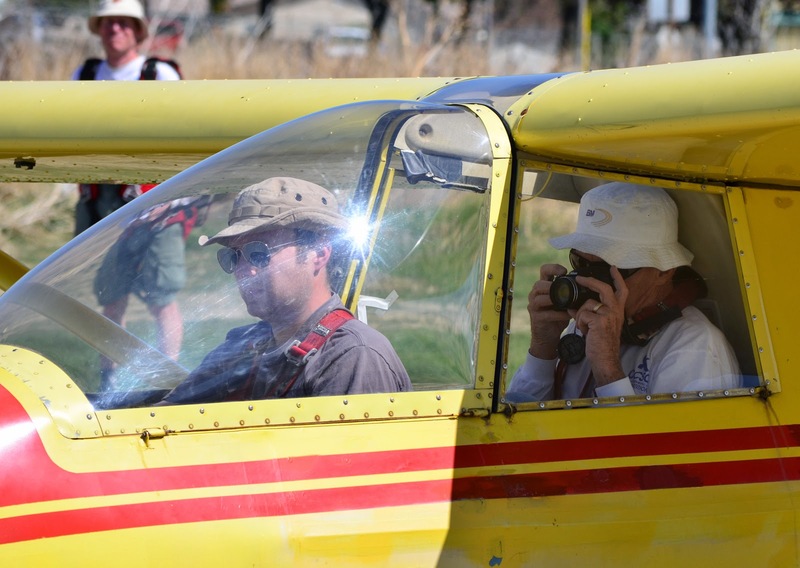 Alex overseeing Jim flying, and also showing his mastery of finding lift. Just about to touchdown. What a day! Remember Morgan taking off at 1:37? He is landing at 6:01 PM, 4 hours and 24 minutes after launch. It was a great day to be at the Gliderport.